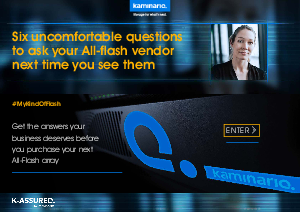 Get the answers your business deserves before you purchase your next all-flash array. There are expensive steak dinners and box seats at sports games. Lots of college-athletes-turned-sales-reps eager to be your best friend. And don’t forget about the marketing schwag! But if you sit down with an IT operations manager responsible for deciding storage strategy, you’ll discover that most actually hate the way they are forced to buy storage. There are probably some interesting answers that can be traced back to the mainframe days. But the simple explanation is that the traditional storage sales process is based on confusion, misdirection, and empty promises.